Last weekend I learned an awful lot about the professional life of artists. 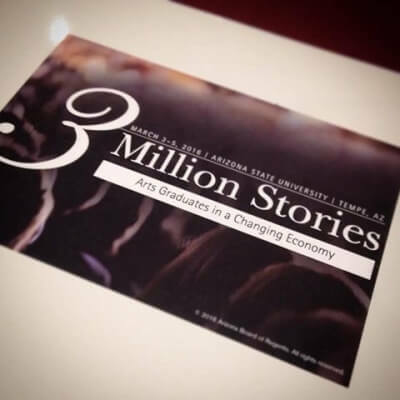 I attended a conference that focused on arts graduates and how they’re faring in this changing economy. What I learned may surprise you. I learned that work is purpose. A job is just that, a job. A career comes with income and status. But what about a calling? Artists feel called to do the work they do. I learned that the point of attaining a fine arts degree doesn’t always have to be vocational. Education is a worthy goal in itself. I learned to understand that the economy is not a morality play. Artists, like teachers and nurses, may serve others with work that has impact, but that doesn’t mean they get paid a fair wage for their effort. But though their salaries may be a challenge, I also learned that artists are happy. In fact, of all the different professions that have been surveyed, ARTISTS report being happiest of all. It seems there is no correlation between income and job satisfaction. I was surprised to learn that a staggering 70% of Americans say they feel disengaged from their work – it’s just a job they do. Yet 82% of arts graduates report feeling “very engaged” with their work. Because it’s a calling, they do it with a sense of purpose. I learned that artists don’t realize how valuable their skills are in today’s world. In survey after survey of the top CEO’s, it’s CREATIVITY that’s always ranked as the number one skill necessary for success. But do you think they’re teaching creativity at business schools? No, I’m pretty sure they’re not. Art school graduates are not bitter, nor are they unemployed. They’re using their creativity thankyouverymuch, and are serving as today’s leaders of the Creative Class. Out of 100,000 art graduates surveyed, a whopping 90% say they would make the same investment in art school again. And get this – 74% of art school graduates work in their field today, compared to only 56% of graduates in other fields such as accounting and biology. And this will make you happy: less than 1% of art school graduates become waiters. Apparently, the stories we’ve been fed about our uncertain prospects are not true. But the numbers don’t lie. This is a wonderful time to be an artist. And yes, it’s scary. It’s hard work. And it’s sometimes challenging to make a decent wage. But honestly, would you really choose anything else?